What is a plunge dip? A plunge dip is a construction that allows to completely immerse livestock in a liquid that contains a parasiticide. Plunge dips are either fix and made of concrete (typical for cattle and sheep) or portable (usually metallic, mainly for sheep and seldom for pigs). Plunge dips were already used worldwide more than a century ago to treat livestock against parasites. At that time arsenics and other quite toxic pesticides were used. The first synthetic parasiticides (organochlorines, organophosphates, etc.) were introduced only after World War II and the dip vats remained as the best option for large properties. Modern delivery forms such as pour-ons and injectables became available only in the 1980's. Plunge dipping remains the most efficient and economic method for periodically treating a very large number of animals against ticks, flies, mites, lice and other external parasites. This is still the case in many cattle farms in several tropical and subtropical parts of the world, where thousands of cattle have to be dipped monthly or even weekly. 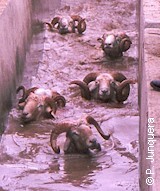 Typical cattle dips have a volume of 10'000 liters or more, sheep dips about 2'000 liters. For sheep, insect development inhibitors (e.g, cyromazine) and spinosyns (e.g. spinosad) are also available in some countries, mainly to control blowfy strike and/or sheep lice. Organochlorines were used a lot before the 1970's but have been withdrawn almost worldwide for use on livestock. Carbamates are very scarcely used for dipping livestock. So far there are no products for plunge dipping that contain macrocyclic lactones (e.g. ivermectin), neonicotinoids (e.g. imidacloprid) or phenylpyrazoles (e.g. fipronil). There are also parasiticides to bathe dogs and cats against fleas, ticks, lice, mites, etc. In some countries many products used on livestock are approved for pets, although sold in much smaller packs. Obviously pets are not thrown into a cattle or sheep dip, but the principle is the same: to immerse the animal in a parasitidical liquid to ensure that all external parasites come in contact with the parasiticide, wherever they are on the pet's body. In the last years such parasiticides for pet bathing have been vastly replaced by more modern and convenient administration methods, mainly ready-to-use spot-ons (= squeeze-on = pipettes). Plunge dipping is especially adequate to control parasites that live more or less fixed to the host such as ticks, mites and lice. The reason is that immersion of the host means also immersion of the parasites, wherever they are, also inside the ears, in the udders, beneath the tail, etc. Other application methods such as pour-ons, sprays or insecticide impregnated ear-tags do not reach such body parts. They are less effective against flying parasites such as horn flies, stable flies, face flies, tsetse flies, mosquitoes, etc., which obviously will not be immersed with the host. Efficacy, i.e. protection against these flying parasites depends on the residual effect of the parasiticide used in the dip, which usually does not go beyond one week against most of these species. But plunge dipping has a number of disadvantages. It needs a substantial investment for its construction. And once built any modification can be expensive, if ever possible. For this reason, most farms have only one dip vat, to which all the animals have to be brought, sometimes from quite a distance, which can be time and work consuming. Changing the product used (e.g. for product rotation to delay resistance) is not easy, because it requires to empty the tank and to dispose off the old dip wash, which may be bound with strict and expensive regulations to protect the environment. Plunge dipping is stressing and can be violent for livestock. Serious injuries are not common, but pregnant animals, calves and lambs and otherwise weak animals have to be dipped separately from adult animals, or not be dipped at all but treated separately with less stressing methods. Water supply has to be ensured. Considering that adult cattle consume up to 5 liters wash, dipping thousand animals means that 5'000 liters water must be available for replenishment during dipping. A serious risk for all plunge dips, especially for cattle is that all currently available products may lose their efficacy against key parasites due to resistance. And most likely they won't be replaced by new products for plunge dipping. The risk is real where the cattle tick (Boophilus= Rhipicephalus microplus or decoloratus) is the major parasite to be controlled, because there are already tick populations resistant to organophosphates and synthetic pyrethroids almost everywhere, and resistance to amitraz is slowly but steadily spreading and increasing. And the fact is that chemical companies are extremely reluctant to develop producst for plunge dipping with new chemical classes. Since about 1985 no new product for plunge dipping of cattle has been developed with the newest classes of parasiticides such as endectocides (e.g. ivermectin), neonicotinoids (e.g. imidacloprid) or phenylpyrazoles (e.g. fipronil). For sheep only spinosad has been introduced for dipping sheep in a few countries. There are two major reasons for this reluctance. The first reason is that it is virtually impossible to find a reasonable method to dispose of the dip wash that is ecologically acceptable for the regulatory authorities and economically feasible for the farmers. The investment in developing such a method, if ever, would be too high for most companies. And the second reason is that manufacturers earn substantially more money with ready-to-use products such as pour-ons and injectables than with concentrates. Fortunately there are still other products (e.g. pour-ons, injectables, etc.) that may work against the cattle tick. But I would think twice before investing in a new plunge dip or in refurbishing and old one. A particular problem exists in regions where not only the cattle tick has to be controlled, but other multi-host-ticks as well (e.g.Amblyomma spp, other Rhipicephalus spp, etc.). These multi-host ticks are usually not resistant to classic tickicides, but there are currently no pour-ons or injectables that provide satisfactory control of multi-host ticks. If dippinng or spraying does not control Boophilus ticks anymore and multi-host ticks are a problem, it may be necessary to tackle both groups separately: pour-ons or injectables against Boophilus ticks (e.g. with ivermectin, doramectin, fluazuron, etc.) and dipping or spraying against multi-host ticks with veteran tickicides. Correctly operating a plunge dip requires discipline and training. Otherwise its efficacy may be insufficient or animal safety may be at risk, with the resulting costs and perhaps trouble. And beware! : more things than you wouldn't imagine can go wrong with a plunge dip. In the following the most important rules for correctly running a plunge dip are summarized. Cattle dips in many tropical and subtropical countries are used constantly the whole year through or at least during several months. The usual practice is that they remain filled the whole year through. Once filled it is important to prevent water to get uncontrolled into the dip vat, because it would dilute the wash and reduce its efficacy. It is obvious that the dip should not be built in a low lying area easily flooded by heavy rains or overflowing rivers nearby. Each dip vat should have a roof and an effective draining system that prevents rainwater to get into the dip vat. In many countries with cold winters fixed sheep dips are used only a few days a year, typically in spring when sheep leave the winter quarters, and in fall when they come back. Once charged it is also important to prevent water from getting uncontrolled into the dip vat. But a roof may not be necessary if dipping can be scheduled for dry weather. The walls and the floor of a dip vat have to be free of cracks and crevices through which water could get lost. Each time a vat is emptied such cracks and crevices must be properly filled. It is important that the remaining volume in a dip vat can be determined anytime. Correct calibration of the dip vat makes it possible. Calibration is usually done once after construction or modification, but may be repeated or checked each time it is emptied. An easy way to do it is to add water to the vat in regular portions (e.g. 100 liters) and to mark the corresponding level in the vat's wall with a permanent paint. This way a visible scale can be read anytime. Instead of the wall a solid stick can be marked to have the scale, but this stick hast to be used always in the same place in the dip, usually in the deepest point. If calibration is incorrect, each dip filling and replenishment may be wrong: either too much product (cost and residues!) or not enough (reduced efficacy). Too much mud at bottom of the vat can falsify the reading in the scale! Where the experience shows that the dip vat gets quickly filled with mud, it must be emptied and cleaned regularly. Animals carry a lot of mud and dirt when they plunge into the dip: mud and dust in the hoofs and the hair coat, remains of feces, hairs or wool, etc. This dirt progressively accumulates in the dip wash and builds a deposit at the bottom of the vat. Now, the active ingredient in the dip wash tends to adhere to these particles resulting in a reduction of its concentration in the dip wash. This can significantly reduce the efficacy against parasites. The dirt deposit can fill up to 25% and more of the dip vat in cattle dips used intensively in regions with clayey soils. Such large deposits can also falsify the reading of the volume scale as mentioned before. A footbath at the end of the race before the dip vat is a must for reducing the mud in the hoofs. The dip vat has to be emptied periodically to eliminate the accumulated dirt. The frequency of emptying depends on the specific conditions of the property: type of soil, number of animals treated, etc. As a thumb rule, the deposit on the ground should not be larger than 5 to 10% of the vat volume. This may require emptying it every 6 months or every 2 to 3 years, depending on its use and location. The mud to be eliminated contains significant amounts of the pesticide used and it is very important to dispose of it following the local regulations for toxic waste disposal. After dipping, it is good dipping practice to keep the animals a certain time in the draining race to collect the dip wash draining off their hair coat. The draining race should be constructed in a light slope the redirects the collected dip wash back to the dip vat. This saves product and diminishes the amount of pesticide that otherwise would contaminated the surrounding land. Initial filling of a dip vat is rather simple. Usually the concentrated product is not emptied directly into the dip vat, but is pre-diluted (e.g. 1:5) in a bucket or larger container. This pre-diluted solution is then emptied along the dip vat already filled with water. Afterwards the dip wash has to be stirred with a hand or an electric stirrer to ensure proper mixing of the product with the dip wash. It is also recommended to use the first 15 to 30 animals that go through the dip as stirrer animals. These animals need to be dipped again at the end. Replenishment can be trickier. Since animals take dip wash away (3 to 5 liters per head, depending on hair coat) the dip has to be replenished. It is common practice to do it when about 10% of the vat volume has been used, although some products may have other use instructions. It is crucial to correctly replenish the dip to ensure that a minimum efficient concentration of the active ingredient in the dip wash is maintained for all animals. There are two major reasons for it. First reason is that if the dip volume diminishes more than 10%, the largest animals will touch the bottom of the vat, which can hinder complete immersion and leave the head and the ears incompletely treated. Second reason is that along the dipping process not only the volume in the dip vat diminishes, but also the concentration of the active ingredient in the wash. This progressive dilution of the wash is known as "stripping" effect. One major cause of stripping is that most active ingredients are lipophilic, i.e. they are better soluble in lipids than in water, and they are absorbed by the lipids in the hair coat. This effect is especially strong on long-wool sheep due to the abundant wool grease. E.g., in a diazinon sheep dip, the initial concentration of 600 ppm (parts per million = mg/liter) can drop down to 100 ppm when about 10% of the vat volume has been used. Obviously, sheep that were treated at 600 ppm won't get the same protection than those treated at 100 ppm. The stripping effect depends on the active ingredient and on its the formulation, i.e. the inactive ingredients in the product (e.g. solvents, emulsifiers, stabilizers, etc.). Some active ingredients strip more than others. Products with organophosphates and amidines usually show a strong stripping effect, whereas many products with synthetic pyrethroids do not. The stripping effect requires that a higher concentration of the active ingredients is used for replenishment than for initial filling. Many products follow the scheme of 1:1000 dilution for initial filling (i.e. 1 liter fresh concentrate product for 1'000 liters dip wash) and 1:500 dilution for replenishment. The use instructions in the label of each product must be carefully read and followed to ensure that the stripping effect is compensated. This is especially important for the control of psoroptic sheep scab (Psoroptes ovis) with a dip before going to the winter quarters in countries with a cold winter. The reason is that if a few animals in a herd are not correctly treated and remain infested with mites, they will very quickly transmit the mites to the rest of the herd and a sudden outbreak in winter can have serious consequences. Traditional scabicides for dipping do not kill the mites' eggs. These eggs survive the dipping and will hatch about one week after dipping. To kill the hatching larvae it is crucial that the scabicide has enough residual effect, i.e., that the concentration of the active ingredient in the wool's grease 8 to 10 days after dipping is high enough to kill those larvae. To ensure this, the concentration of the active ingredient in the dip must not go below a certain minimum, and the sheep must have a t least 1 cm wool when dipped. Longer wool doesn't harm, but will consume more product. To ensure complete coverage with the dip wash, livestock must be dry before dipping. Otherwise the dip wash will not soak the hair coat that is already saturated with water. Fixed dips must be long, wide and deep enough to ensure that the animals get completely immersed when plunging, and have to swim a few meters before touching the bottom again. This is very important for all body parts to be completely wet during dipping. 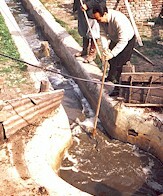 It is highly recommended that an operator pushes each animal's head ate least once again into the dip wash using a special stick for this purpose, also in large cattle dips. When using small dip vats (portable or circular ones) for sheep or goats it is crucial that each animal remains at least 1 minute in the dip wash. Since the inner part of the ears are often infested with various mite and tick species the head of all animals must be immersed at least twice. This requires discipline from the operator, since the shorter the animals remain in the dip, the sooner he will finish work. 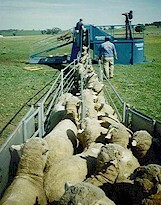 If it rains earlier than 12 hours after dipping, sheep that were treated against psoroptic mites or lice before going to the winter quarters should be dipped again, because rain can wash away part of the product before it has impregnated the wool's grease and the potential consequences of an inefficient treatment are much more expensive than dipping the animals again. In other situations or for cattle this is also highly recommended, but the consequences may be less dramatic. It is obvious that operators have to wear protective clothing to avoid direct contact with the parasiticides that can be considerably toxic, especially organophosphates and carbamates . The use instructions (e.g. using protective gloves, mask and special clothes, etc.) and whatever regulations have to be strictly followed. A single accidental exposure as falling into the dip is usually not dramatic for a healthy adult, but the affected person has to be brought immediately to a medical doctor. Quite dangerous can be the frequent and repeated skin contact with dip wash or the inhalation of toxic vapors (e.g. when helping or handling animals during or after dipping). This can in fact happen to professional dippers that spend months going from farm to farm to dip the sheep and are exposed to potential contaminations during many hours a day. A similar situation can happen for workers in very large cattle farms during the high tick season (it can last longer than six months) when the dip is busy almost every day to treat all the different animal groups in the property. The risks for operators when using such chemicals as organophosphates and synthetic pyrethroids for sheep dipping have been broadly investigated and discussed in the last years in several countries, especially in Australia and the UK. They have resulted in much stricter safety measures and regulations, and even to the partial or complete withdrawal or certain products. The fact is that in the meantime there are enough alternatives to dipping (e.g. injectables, pour-ons) that are as effective as the old dips, but much safer for the operators. Such alternatives are often more expensive in terms of product cost per treatment. But if the cost of complying with the new regulations and its inconvenience is added, the total cost per treatment can make the alternatives more attractive. In case of incidents or doubts, a medical doctor has to be visited as soon as possible, telling him about the product involved (best is to bring him a product label). To minimize the health risks it is important that livestock can rest and drink before dipping. The way to the dip in large properties can be exhausting and dipping can be quite stressing for animals, especially if they are not used to it. If animals are thirsty they may drink dip wash, which can have toxic effects. All this can be too much for weaker animals. Therefore pregnant, young, sick or old animals have to be treated separately and maybe not dipped at all, but sprayed or treated with alternative products. Dipping with most sheep scabicides requires using freshly prepared dip wash. This is due to the risk of "post dipping lameness" (= PDL), a pathology that can affect sheep shortly after dipping. It is caused by the soil bacterium (Erysipelothrix rhusiopathiae) than can multiply very quickly in dip wash. Such bacteria can infect sheep through small injuries and scratches caused by the dipping itself. Outbreaks can cause numerous deaths, especially of lambs and otherwise weak animals. To avoid it the dip wash must be renewed daily, or otherwise a bacteriostatic agent has to be added to the dip wash following the label instructions. To reduce the risk of a PDL outbreak it is highly recommended to thoroughly clean the dip vat before filling, especially for eliminating any kind of organic dirt (mud, remains of feces and wool, etc.). The risk of PDL is real! The author of these lines once had to immediately travel from Switzerland to Northeast China in 1992 in order to sort out a complaint: several dozen sheep have died after dipping with a diazinon product and the customer (the management of a huge government farm) was convinced that something was wrong with the product. It was quite hard to get to the "scene of the crime" (500 km east of Ürümqui, early winter snow, unpaved roads, etc. ), certainly harder than finding out that they have had a PDL outbreak. But the hardest was to convinced them that it was their fault. The potential damage to the environment is very high if contaminated dip wash is disposed of incorrectly. This is especially true for dips charged with synthetic pyrethroids. If several thousand liters dip wash get into a river or a lake it can be catastrophic for fish and many other aquatic organisms. Therefore its an absolute must to comply with all the regulations regarding correct disposal of dip wash or whatever dip waste.